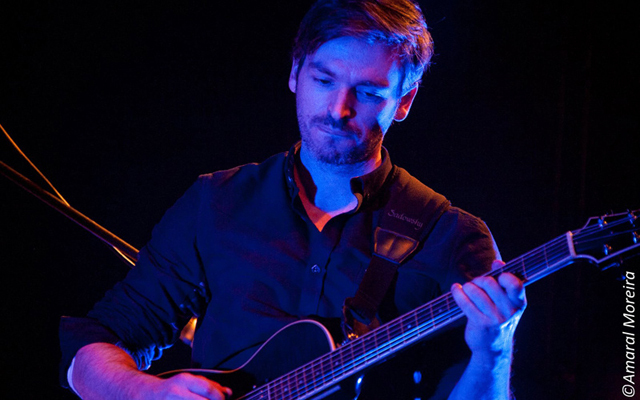 Bruno Macedo seems to have maintained a particular fondness for his guitar quartet and worked at it on and off for some years now. His guitar prowess and harmonic adventurousness – especially in this album, 8mm has earned the admiration of his peers, not only in Portugal, but in the rest of Europe as well. His opuses of a science-fiction film, no less, exemplify the linear and visual form of moving pictures so beloved of its composer. The music is so supercharged on a track like “Supernova”, for instance, that it virtually tears itself apart at times on the album. Envisioned as a kind of science-fiction home movie, the music glorifies the genre as well as becomes a notional soundtrack for the “film” itself. His quartet keeps the temperature of the music ice-cold and the intensity (of the music) at a feverish pitch. Mr. Macedo’s chamber music is beloved of his musical partners, who give off their best here, as it is invidious to be forced to choose one solo over the other in most songs. Thankfully these individual sojourns make such a natural coupling on disc that there is no need to separate them—the introspective, weightlessly melancholic of some, and the evanescent lyrical subtlety of others. 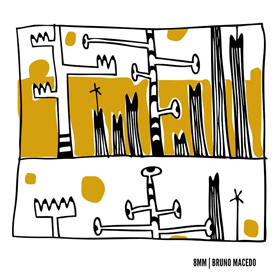 For such a stylistically magpie-minded composer, it might have seemed something of a surprise when Bruno Macedo first unveiled his guitar quartet cast in a large-scale 8-piece soundtrack in a sort of symphonic form. Here the quartet does not just articulate a contemporary creative perspective; it represents a vivid reimagination of a mysterious film. The tone of keening mysticism that imbues it is thrown into stark relief with a colourful centrepiece (“Folha”) a contrast that is fully exploited. This might be Mr. Macedo’s most ambitious album to date. If connected, one song to the other—as I suggest that it must be—it contains some of the guitarist’s most thrillingly radiant melodic writing. Thrillingly dedicated to his instrumentalists, I might add, the music becomes a new benchmark for this young guitarist. Not to put too fine a point on the songs, Mr. Macedo has, nevertheless created something unmistakably inspired and inimitably singular as well. The record overflows with generous melody giving it a sense of epic proportion. It is also of a distinctive voice. The result is one of Bruno Macedo’s finest works, combining a natural gift for songfullness with highly individualistic dance-like style. The guitar quartet may have been explored before, but Mr. Macedo exploits the form to the fullest. From its very first moments in the opening tracks this music brims with delirious invention finding its tumbling scales and block chords with breathtaking beauty. All told the music of 8mm combines to form a sort of coup de theatre and who best to share this with but pianist Pedro Neves, bassist Miguel Ângelo and drummer Leonardo Leonet?